At Family Life, we have strong opinions about toys. Anything that is destined to last a week, either because it is poorly made or because it relies on a single gimmick that children soon tire of, will never appear in our pages. We believe that good toys are built to last, because they are well made and designed to hold a child's interest for a long time. They allow children some creative room, some ability to imagine and invent, to bring something of themselves to the process of play. This year, senior editor Heidi Benson led an ambitious undertaking for our "timeless toys" feature that took almost four months from start to finish. First, she and managing editor Wendy Isreal spent two hectic days in February at New York's mammoth Toy Fair, in the Javits Center, investigating all the new toys on the market. Over the next two months, Benson took a look at samples and information for nearly 300 toys. After a careful review of the field, she suggested to us a group that we then put to the test. On June 15, we assembled 70 children at the 200 Fifth Club, in New York's Toy Building, to push, press, throw, kick, and generally monkey around with over 200 toys, and to give us their notes on their favorites. Family Life's staff (some of whom, like photo assistant Janeen Koban and intern Rory Halperin, had assembled the trickiest toys) played with the children and got their sometimes strong opinions. The result: 32 great toys we feel confident will stand the test of time, and of discerning children everywhere. "It's like a cross between a Ouija board and a hoola hoop," said my husband John after trying a few rounds. I agree, it mesmerized me and I found myself wiggling my hips. Playing with this toy can be like a ritual dance. As you get into the groove of tilting and swaying the large round board on which the stone egg or eggs are spinning like tops, you can get a rhythm going that may put you into a trance. Cooperation, timing, concentration, and even letting yourself go are all involved in the object of the game - keep those eggs spinning. It reminds me of how I like to play Ping Pong or Smashball - cooperating to keep the ball going is more fun to me than trying to foil the person on the other side. When I was a kid, I can remember spending hours absentmindedly spinning quarters on a table while chatting with friends, seeing if we could get the spin just perfect, trying to keep at least one quarter spinning at all times, speculating as to which one would spin the longest. If you've ever been drawn in by this kind of simple, yet satisfying activity, then The Original Egg Game will really appeal to you. One or two players hold a smooth, flat, 3' wide disk horizontally between them, like a tabletop. Someone gives a marble egg a quick starting spin on the disc, and the player or players tilt and move the disk to keep the egg from falling off of the edge. This motion also keeps the egg spinning. With a larger disc, as many as four people can play. Now, I have to admit that when I heard this game described, number one, I didn't think it would work. I thought it would be hard to get the egg spinning, and I didn't see how moving the disk could keep it spinning. Secondly, I couldn't imagine that it would actually hold one's attention for any length of time. It took a little bit to get the knack of spinning the egg, but it's actually very easy if you kind of snap it between your fingers -- it's just like a top. Once it's spinning, it naturally starts to drift around the disk. Instinctively, you tilt or move the disk to keep it from falling off, and voila! You're doing it! It takes 30 seconds to get the hang of it. Okay, so you've got that down, but how long are you really going to want to keep doing this, right? Indefinitely. Watching the egg circle and slide around the board is absolutely mesmerizing. Add a second egg to the disk, and you have a pair of dancers moving in tandem or spinning around each other. Constantly on the verge of being out of control, they depend on subtle adjustments from you to keep them from slipping off the edge. I could just picture this fascinating game in a classroom. There's no competition, and there's really no winning or losing. Students cooperating to keep the egg going for as long as they can, building social interactive skills and hand/eye coordination at the same time. The only problem I anticipate is getting them to stop! This is going to sound stupid, but there is a guy in Big Arm who wants to market a game involving a flat board and an egg shaped stone. That's correct - a stone egg and a board. Today in an age of grenade throwing, fire-breathing, blood-and-guts action games, in an age of 3-D video graphics, Dolby audio and buxom computer babes, Erich Jonas thinks he can crack the market with ... an egg. The thing is he may be right. 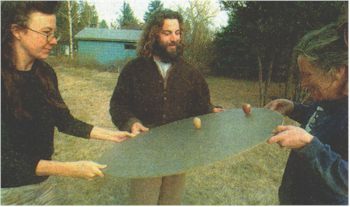 "The goal of the game is to perpetuate the motion of a spinning stone egg," said Jonas, inventor of The Original Egg Game. "That's a pretty basic concept, but it's a satisfying one. There's something beautiful about a spinning stone egg. It's a metaphor worth exploring - it's similar to what we're all doing on planet Earth." You see? At first you think he doesn't have a snowball's chance with this game - he's not even going to get kids to look up from their computer monitors, much less try it out - but then he lays this spiritual trip on you and suddenly you're thinking about everything that's wrong with today's youth - hell, with the world in general - you're wondering what you're doing with you're life, and more generally what's up with this millennium-bug-bitten, Clinton-Lewinski-stained-dress (Who keeps that kind of dress? ), divorce-happy, saturated-fat, I-got-mine culture we're living in... and the next thing you know you're calling up to order a game for yourself, plus a second one in hopes it will straighten out your little monster nephew, and maybe a third one for your boss while you're at it. Because everything's spinning out of control and this game might help you get a handle on it. Whew! That's some game. "It's a product of merit," Jonas said without bragging. "It has a larger meaning." The idea first hatched 12 years ago. "I had a stone egg," Jonas said. "I spent a lot of time spinning it." One day, he and a friend discovered that by spinning the egg on a table top and tipping the table back and forth they could keep the egg going indefinitely. After moving on to other things, Jonas returned to that memory in 1995, taking the concept and turning it into a marketable game. 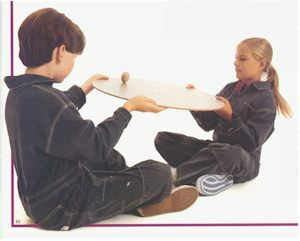 The Original Egg Game consists of a smooth masonite board and one or two onyx eggs. The board can either be 13, 24, 32, or 48 inches in diameter; one egg is used with the smaller boards, two with the large versions. "The actual principles at work are potential energy and friction," Jonas said. "The tip of the egg is in contact with the board and friction causes it to spin. By tilting the board, you create a downward path that keeps it going." There are no winners or losers, he said. The only objective is to keep the egg spinning. Doing so - particularly with the larger boards - requires participants to talk with each other, which is why he refers to his invention as a "21st century game of communication and cooperation," Jonas said "I gave the game to a group home in Ronan. The people there are struggling, and this is a great medium for them to work together." "I just came back from a high school leadership seminar in Missoula," Jonas said. "There were forty students passing eggs from board to board. This is a game of actual reality in a virtual world, it was great watching people who weren't plugged into a screen." The egg game also has a worlds record to its credit. During the First Night Missoula celebration last New Year's, three teenagers kept one egg spinning for three hours and one minute, breaking the previous Guinness Book of World Records mark for "perpetuating the motion of a spinning object" by more than an hour. "This game kept a group of three 12 year old boys busy for three hours, with no batteries involved," jonas said. "So how bad can it be?"